what is Automated box while configuring SAP Predictive Factory? Aug 01, 2017 at 10:45 AM | 55 Views | Last edit Aug 01, 2017 at 07:28 PM 2 rev. Our team is trying to install the SAP PF but we are not getting what is automated Box in SAP PF Landscape and what is the use of this? There is CORBA also available please suggest some solution. 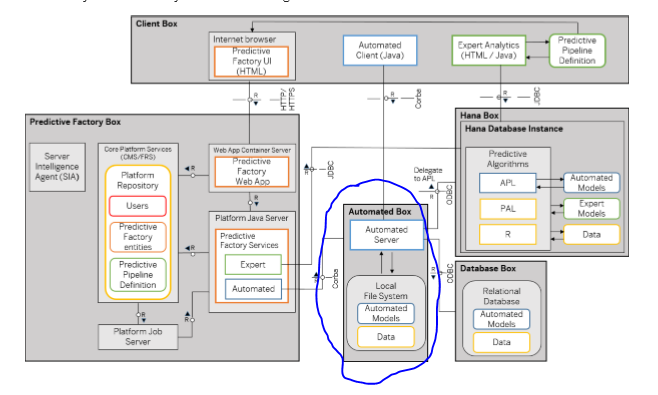 This is the Predictive Analytics server aka Automated Server. The net new is the fact that you be able to use Factory, you need a PA server to power the Factory behind the scenes. It is mandatory if you are dealing with Automated Models in Factory. Can you do me a favor: please use only the tag "SAP Predictive Analytics", not multiple tags at once.